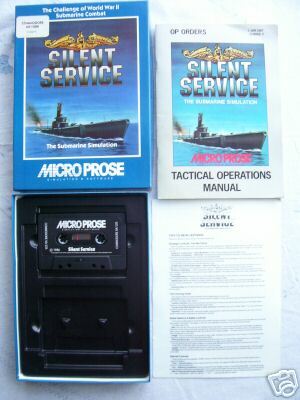 Captain your own World War ll submarine in the treacherous South Pacific.Silent service is a highly accurate simulation of actual combat missions.Your submarine features all the critical battle stations-the engine room,conning tower and ships bridge-and has a sophisticated attack plotting system...As Captain,you'll not only face the threat of single ships,but heavily escorted convoys.The action is heart pounding;the pressures are intence.Will you select a quite patrol sector in the Marianas Islands or choose the dangerous waters off the coast of Japan? Is it better to make a submerged periscope attack or a surface attack at night?...Actions and decisions are constantly required as you find,attack and sink the enemy's shipping...There are four skill levels and various 'reality level' so you can customize complexity...GET READY TO TAKE THE HELM!!! !